Home Should We Be Concerned about Stress Shielding in TKA? Should We Be Concerned about Stress Shielding in TKA? The authors say that stress shielding is almost certainly the cause of loss of bone density in total knee arthroplasty, either due to protection of the underlying bone from the forces normally transmitted across the patellofemoral joint, or to bypassing of the distal femoral bony structures as weight-bearing loads are transmitted through the stiff femoral component to the tibia. These factors can be interrelated. For example, mechanical loosening may be due to adverse periprosthetic bone remodeling following stress shielding, together with an osteolytic response to wear particles. Adverse bone remodeling associated with the femoral component of TKA is difficult to evaluate because the anterior flange of the femoral component obscures the radiographic field of view. Routine lateral radiographs of the resurfaced distal femur may show a reduction in bone density in the distal femur adjacent to the patellofemoral joint (Figure 1). Axial CT scans of the body were taken at 1mm intervals at a pixel resolution of 512 x 512, with each pixel made up of 12 bits of gray tone. The femoral models contained more than 33,000 linear, hexahedral elements and the tibial models about 90,000 linear, hexahedral elements (Figure 2). 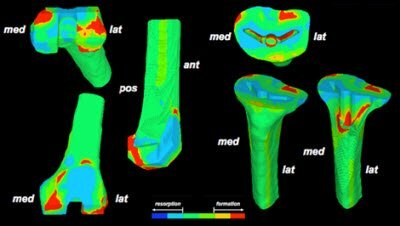 Material properties for the bone elements were assigned based on mapping the CT data. For the replaced knee, we utilized a generic femoral component with five bone cuts. The generic tibial design had a central keel to mimic contemporary knee implant designs. Loads and boundary conditions at 15% of the gait cycle  were applied to the models. A force of 1.9 times body weight was applied to the medial tibial plateau and mating femoral condyle, while a force of 1.1 times body weight was applied to the lateral side. A patellar load of 0.5 times body weight was used. For the initial analysis, femoral and tibial components were assumed to be fully bonded at their fixation interfaces. Figure 2. Femoral and tibial finite element models. For the femoral construct, a sagittal section through the midline of the distal femur showed that, compared to the intact femur, the presence of a femoral implant results in a remodeling signal that predicts bone loss in the cancellous structures behind the anterior flange of the femoral component (Figure 3, left). Some densification of bone at the distal and posterior fixation interfaces is predicted. 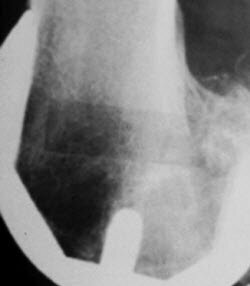 In the tibia, the cancellous structures immediately under the tray are predicted to lose density. A coronal section through the tibial midline suggested that, concurrent with proximal tibial bone loss, the state of stress at the distal aspect of the tibial fixation keel will lead to bone densification (Figure 3, right). Figure 3: Predicted bone remodelling after resurfacing of the femur and tibia with metallic components. Areas in blue suggest bone loss will occur, areas in red suggest bone densification. What do these results mean for clinical practice? Loss of bone density in the anterior femur and the proximal tibia is frequently seen when knee components are removed at revision surgery. This is often ascribed to osteolysis. Our model suggests that even if osteolytic changes are present, the prime cause of reduced bone density seen at revision is stress shielding resulting from a non-physiologic state of stress in the presence of metallic implants. Although rarely the prime cause of revision at moderate follow-up intervals, the reduction in bone density caused by stress shielding may allow ingress of wear particles into fixation interfaces. For young patients who expect very long survivorship, the steady and increasing loss of bone may lead to stress shielding, becoming the root cause of arthroplasty failure. As efforts continue to produce the “forgotten knee that will last for decades”, our data suggest that the influence of stress shielding on bony structures should be taken into consideration in the implant development process. Michael T. Manley, FRSA, PhD, is with the Homer Stryker Center for Orthopaedic Education and Research, Mahwah, New Jersey. Kevin L. Ong, PhD, is with Exponent, Inc., Philadelphia, Pennsylvania. Bozic KJ, Kurtz SM, Lau E, Ong K, Chiu V, Vail TP, Rubash HE, and Berry DJ (2010). The epidemiology of revision total knee arthroplasty in the United States. Clin Orthop Relat Res 468(1): p. 45-51. Soininvaara T, Nikola T, Vanninen E, Miettinen H, and Kroger H (2008). Bone mineral density and single photon emission computed tomography changes after total knee arthroplasty: a 2-year follow-up study. Clin Physiol Funct Imaging 28(2): p. 101-6. Au AG, Liggins AB, Raso VJ, and Amirfazli A (2005). A parametric analysis of fixation post shape in tibial knee prostheses. Med Eng Phys 27(2): p. 123-34. Van Lenthe GH, de Waal Malefijt MC, and Huiskes R (1997). Stress shielding after total knee replacement may cause bone resorption in the distal femur. J Bone Joint Surg Br 79(1): p. 117-22.